the next 32 bits (64 to 95) to 0. Then another pointer of memory size 3200 is created. The address of this new pointer is written in the first buffer between the bit 127 to the bit 127+64=191. Then we return the address of the first buffer. PS: Additional question: why 'rax+1' is to understand as 'rax+8bits ' instead of rax+1bit? There is a buffer of size 256 bytes created (malloc) in this buffer, the first 32 bits are set to 0 (because dword designates 32bits size) the next 32 bits (32 to 63) are set to C8h the next 32 bits (64 to 95) to 0. Well it will be the 128th bit. The qword at rax+0x10 is 128 bits from the head of your first malloc. But these aren't strictly bit offsets. You can calculate how many bits from the start of memory, but I would question why it matters. rax is a 64 bit register so you can use it to represent 2^64 values. If rax is 0x12345678 and I add 1, what should happen? It will become 0x12345679 regardless of how many bits you want that to represent. (Oversimplification but I hope this make the point). So because [rax+4] represents a pointer to byte addressable memory, the +4 represents 4 bytes. This is only because the m32 operand to mov is concerned with the address of bytes. There are other x86 instruction that can manipulate bits, but not this one. Not the answer you're looking for? Browse other questions tagged assembly linux x64 or ask your own question. Can mprotect set the stack itself as executable? 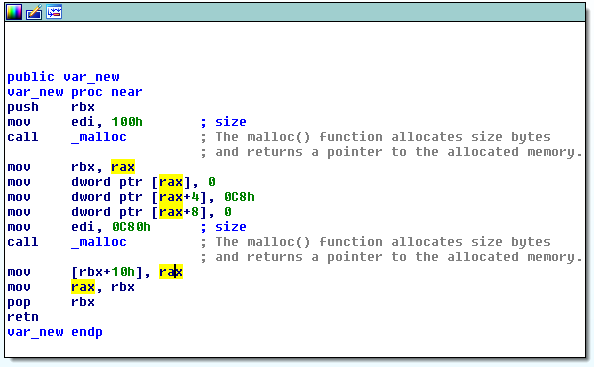 Is IDA pulling my leg - or can REX.W sometimes not be determined in static analysis? VirtualProtect failed to revert protections on mrdata section of ntdll, why?